The scenes of desolation after the closure of London’s Royal Docks were a miserable sight for some, but the perfect setting for scenes from Stanley Kubrick’s disturbing 1987 film, Full Metal Jacket. West Silvertown doubled as Hué, a war-torn Vietnamese city. 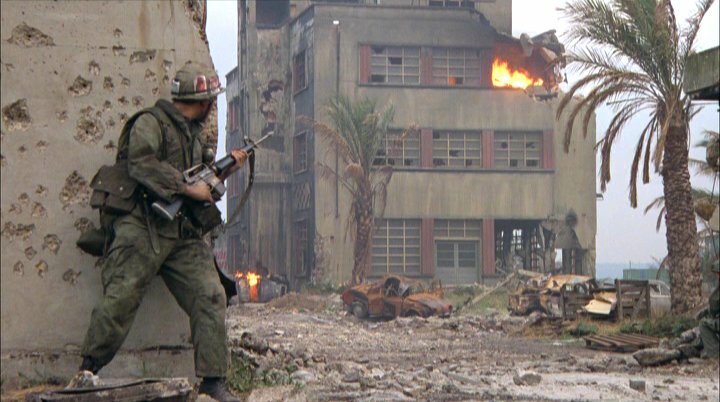 Despite the area being suitably dilapidated, director Kubrick ordered partial demolition of buildings to replicate the bombed-out conditions of the film. The cast and crew also had to contend with the significant dangers presented by the toxic conditions of the abandoned docks, particularly from asbestos and poisonous chemicals. Surprisingly enough, these hazards are not discussed in an otherwise revealing item on the film, which starred Matthew Modine, from the BBC programme Film ’87, presented by Barry Norman.